Who are we to write this book? Jeff started working in radio advertising in 1995 when the direct response radio advertising industry was first taking off. He gained experience both as a direct response radio media buyer, working in a direct marketing company, as well as on the sales side, working with radio stations. Brett has held senior marketing and management roles in small, medium, and Fortune 50 direct marketing companies for nearly twelve years. At the time of this writing, we’ve worked together for almost eight years as the owners of Strategic Media, Inc., a leading direct response radio advertising agency. The vision that led to Strategic Media began with a deep curiosity—what would happen if we combined the best of radio advertising techniques with the sophisticated database-enabled practices of traditional direct marketers that use catalogs and direct mail? To satisfy our curiosity, we built a direct response radio agency not on demo reels, fancy lunches, and flashy dog-and-pony showmanship, but rather on something very straightforward and likely much more boring: substance. Our sole focus has been creating radio advertising campaigns that generate measurable results and profitable new customers. The foundation of this focus is our radio advertising results database, which contains the results of over a thousand radio advertising tests relating to hundreds of radio advertising variables. 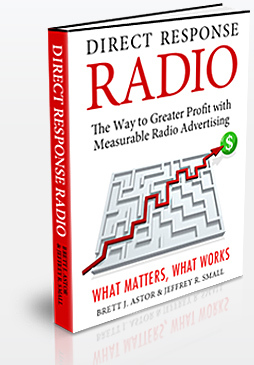 We know of no other such database that captures what works in radio advertising, nor one that does as much to help businesses capture the potential that direct response radio advertising offers their businesses. ï¿½2007 DirectResponseRadio.com. All Rights Reserved.